We had reported that yesteryear Dilip Kumar who is in his nineties is bed ridden and is getting recovered from illness. Dilip Kumar was hospitalized in one of the hospitals in Mumbai, and few B'wood celebrities paid their visit at the hospital. Stars like Shah Rukh Khan and others who were shooting abroad met Dilip Kumar when they were back to the country. The latest to pay a visit to the actor is Priyanka Chopra. One of the busiest actress in Bollywood who is working on both Bollywood and Hollywood films finally took some time to visit Dilip Kumar at his residence in Mumbai. 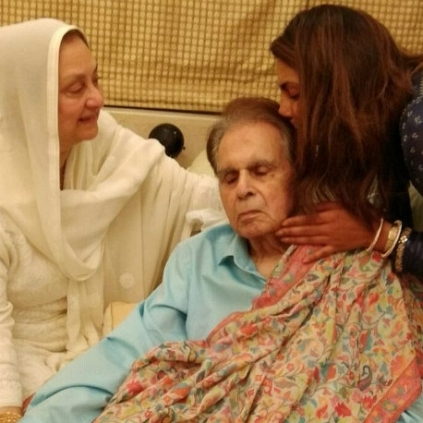 As per reports, Priyanka Chopra had a casual interaction with Dilip Kumar and took his blessings during the visit. PCee is known for making style statement time and again. Bollywood's leading actress Priyanka Chopra is definitely on a roll! The actress who made her Hollywood debut early this year in 'Baywatch', won critics for her vigorous role. Priyanka Chopra later bagged two more Hollywood films and surely wants to create a strong impact. Priyanka Chopra is also active in social blogging site and is seen interacting with fans often. The latest is that Priyanka Chopra released a series of photoshoot picture online and fans are going crazy seeing the pictures. Priyanka Chopra is sizzling in the photoshoot, and her bold shoots have won fans heart and the pictures are going viral among Bollywood fans.This is not the first time Priyanka Chopra is impressed her fans by such photoshoot, early to this, the actress had done similar bold shoot and won applauses. People looking for online information on Priyanka Chopra, Shah Rukh Khan will find this news story useful.